c-base Open Moon will demonstrate that the community creating wikipedia is able to fly to the moon. We deliver tools helping everyone realize their vision. We shape new collaboration standards. We will define a new industry standard for innovation methods and tools. 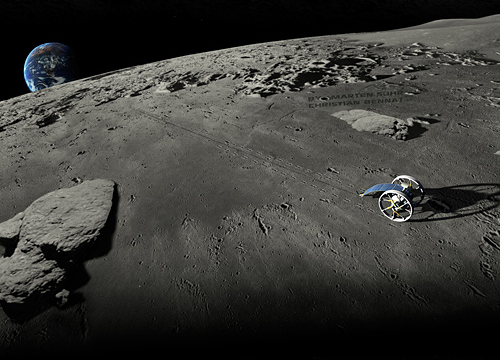 To turn things true c-base Open Moon participates in the Google Lunar X Prize. Our team is open for community, open source and innovation. Be a part of us and/or send us your ideas for the right way to fulfill the mission and what will follow. We are looking forward to your technical and technological contribution to built our space future. Commoonity into space means: Your engagement defines our future in space. Liebe Grüße aus Berlin. Wir von tonarchiv.de verlinken euch schon seit Monaten. Was wollt ihr denn auf dem Mond? Ist doch Schnee vom vergangenem Jahr. P. S. Räumt ‘mal die Spam von eurer Website. es gibt Wasser auf dem Mond. Eventuell mal rechaptcha plugin einbauen gegen den spam? Sollte den aufwand enorm verringern.